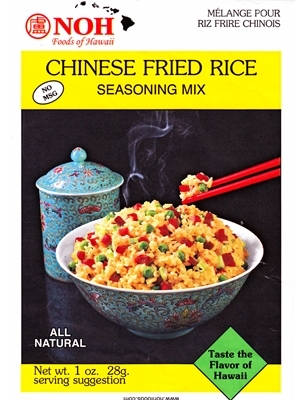 NOH Chinese Fried Rice Seasoning Mix taste the flavor or Hawaii. Heat oil in Skillet. Place diced meat in skillet and sprinkle 2 tablespoons of NOH Chinese Fried Rice Mix. Stir-fry for one minute on medium heat. Add cooked rice and mix. Add remaining ingredients and mix well. Cornstarch, natural cane sugar, powdered soy sauce (wheat, soybeans, salt, maltodextrin), nonfat dry milk, salt, garlic powder, onion powder, spices.